It got me thinking about meme evolution and about Hawks vs. Doves (Game Theory) I learned about in Richard Dawkins‘ book “The Selfish Gene“. In a way, this is a struggle, and only one lifestyle can prevail – the Western, modern, free, skeptic way of life, or the ultra-conservative, religious way. However, the clashes between these opposite forces are important and natural factors in any social change. Which one will win? Which will be more “adaptive”? Will the aggressive one win? A quote from the movie still troubles me. A translation of the word Jihad supposedly means “inner-struggle“. So does “Mein Kampf“. 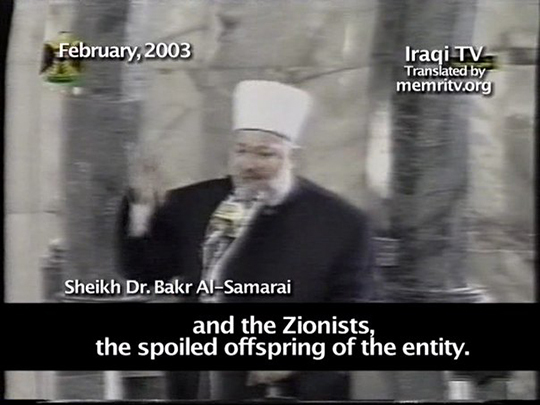 Another troubling quote: “Zionists [are] the spoiled offspring of the entity“. Their God (“entity”) means a world of difference from what I see in my mind when I think about God. And it’s supposed to be the same god. The question “Why do they hate us” leads us to blame ourselves. They must be suffering if they are so frustrated, otherwise, why would they spend that much energy, instead of just live and enjoy life? We must have done something to them! This is a very logical thought, which is very widespread in the Academia and with Leftists – but could it be that there is another explanation? Additional quote: “If you want to get people to fight, you have to make them think that there is a threat and that they are in danger.” People who are angry become hateful. This enables them to fight. When they say “Death to America“, what they’re actually saying is “Death to Change”, or “Death to Modernism”. People who try to see themselves from their perspective, like the extreme leftists, are acting dumb, thinking their “minds” are alike. The language, ideas and culture is so different, they think in different terms. It’s very politically correct to try to put ourselves in their shoes, but this thought experiment can be very very wrong. Additional quote: “Every one [in the West] is ignorant. Someone always says ‘this is just an extremist group’, and the speaker feels not politically correct for the generalization“. People around me seem to idolize Democracy, forgetting it’s not perfect. It has merely “done less harm, and more good, than any other form of government” (Will Durant, The Lessons of History). It is especially not designed to withstand advanced, post-modern attacks against it. Yet again, we are “strangling ourselves with our Political Correctness”, which reminds me to re-read Gadi Taub‘s “A Dispirited Rebellion” (המרד השפוף). How come there is no Gadi Taub page in the English Wikipedia? In order to create a clear-cut between friend and foe, the movie claims, there must have been a global, unifying event which would unite the world – Muslims and non-Muslims. This clear-cut was made, in their eyes, with the events of 9/11. For us, it’s still very very hard to determine who’s a friend and who’s a foe, because there are too many options. It’s not as clear-cut. This enables combatants to live among civilians and infiltration. This made me think about a Computer Anti-Virus analogy – but in the West’s case, the detection of viruses is very very difficult. The movie talks quite a lot about this struggle as a continuation of Nazism. I’m afraid it’s a lot worse. This is DISTRIBUTED NAZISM. A very painful claim that is made in the movie is about the extremists’ crime against their children. The worst form of child-abuse is education to hatred. We all see, and ignore, what goes on in the Palestinian, Iranian and the rest of the Arab/Muslim world’s media. Blood, gore, body parts – and this is what their children are exposed to. And this is not only the extremists here, this is the mainstream. These are just several points, off my head. I would love to read your comments and discuss this with anyone. I’m afraid that as time passes, it’s going to be to late to stop World War 3, if it isn’t already.